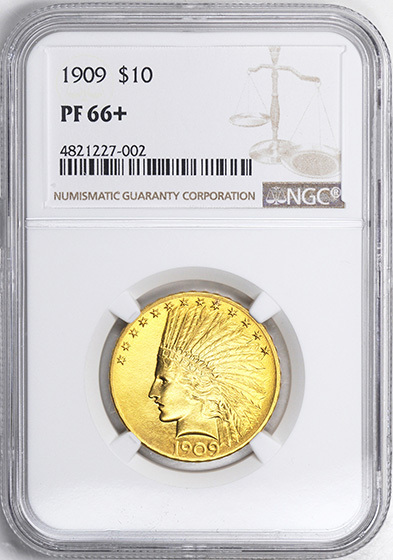 The new gold coins of 1907 were the result of the unprecedented collaboration of a great sculptor and a dynamic President. Awed and even frightened by the youthful Theodore Roosevelt’s bounding energy, Republican Party leaders in the 1900 campaign had hoped to corral him in the largely ceremonial post of Vice President, while giving the Presidency to less vigorous William McKinley of Ohio. McKinley’s assassination at the opening of the Pan American Exposition in Buffalo, N.Y. in 1901 hurtled Roosevelt directly into the White House—with far-reaching effects. Elected President in his own right in 1904, Roosevelt was unhappy with the trite Inaugural medal designed by U. S. Mint engravers Charles E. Barber and George T. Morgan. 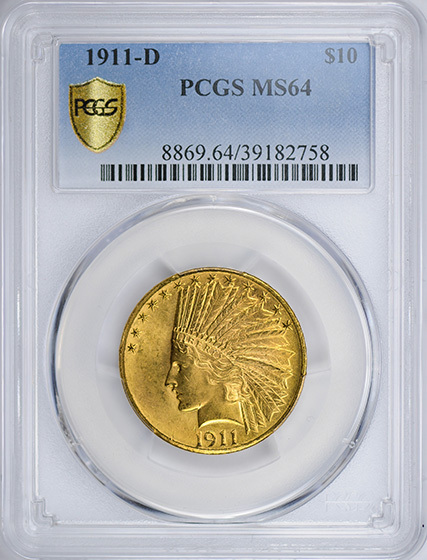 His interest in numismatic art was awakened when his artistic friends urged the commissioning of a really innovative Inaugural medal, and suggested the great American sculptor Augustus Saint Gaudens for the task. The sculptor agreed, but his busy schedule limited him to sketching the basic design on a paper napkin while on the train from Washington. 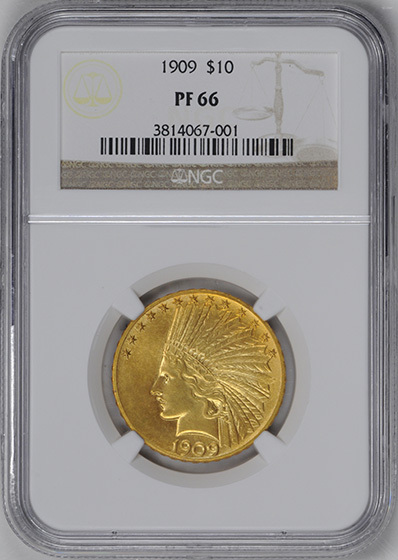 He told Roosevelt that he would entrust all the actual work to his 34 year-old associate, German-born Adolph A. Weinman, better known to collectors today for his Mercury Dime and Walking Liberty Half Dollar. 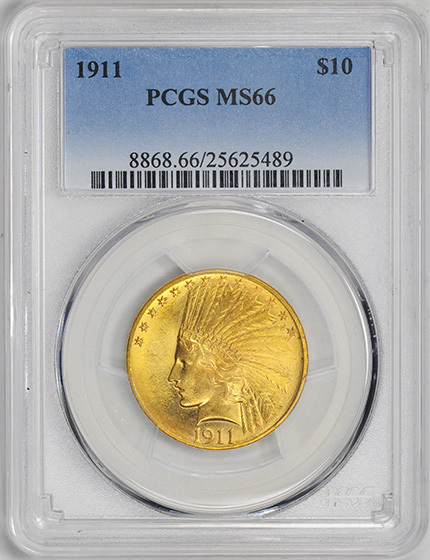 The Saint Gaudens/Weinman Inaugural medal featured a bust of the President on the obverse, with a bold standing eagle on the reverse. Triangle-shaped “periods” divide the inscriptions on both sides. 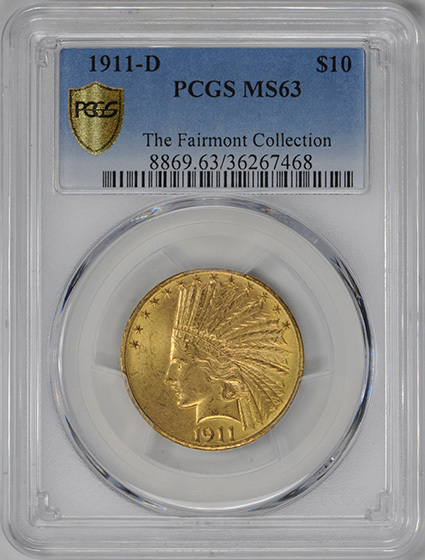 The medal received widespread acclaim, and Roosevelt went to work to force similarly creative redesign of the nation’s coins on the unwilling and obstructive Chief Engraver Barber. Joyfully calling this project “my pet crime,” the President rallied Saint-Gaudens to the cause, although the sculptor’s health was rapidly deteriorating. 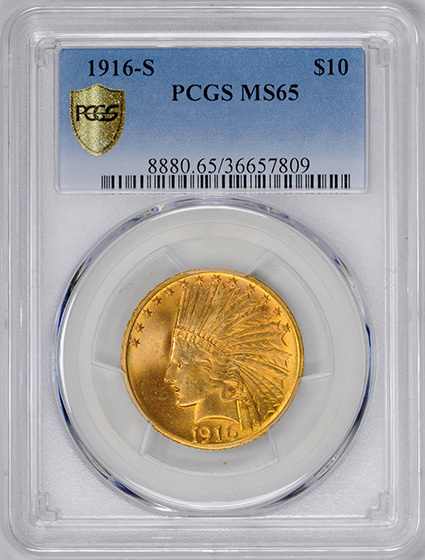 Saint Gaudens immediately began work on new coinage designs. He fashioned images of Liberty in both full figure and bust motifs, and eagles in flying and standing positions—the latter derived from the reverse of the Roosevelt medal. 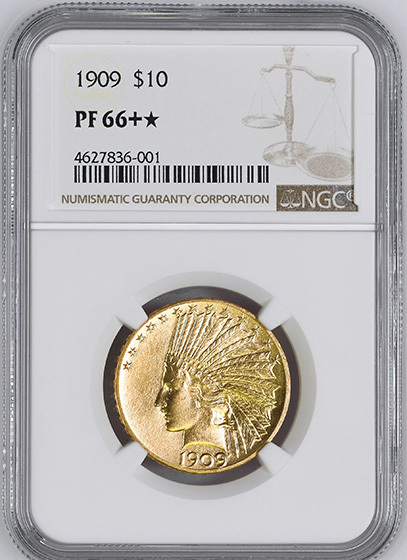 Although he preferred the bust of Liberty and the standing eagle for the twenty dollar coin (as they appeared on the unique 1907 $20 pattern), after much correspondence with the President throughout 1906 and early 1907, it was finally decided that this combination would appear on the $10 gold coin. The bust on the new eagle was almost identical to the Nike head (Victory) that Saint Gaudens designed for Sherman’s monument in New York’s Central Park. At Roosevelt’s insistence, she shed her laurel crown for a handsome, but historically impossible Indian feathered war bonnet. LIBERTY was inscribed on the Indian’s headdress, with 13 stars above the head and the date below. The reverse’s eagle stands on a bundle of arrows, with the motto E PLURIBUS UNUM to the right. Encircling the periphery above the eagle is the legend UNITED STATES OF AMERICA. Below is the denomination TEN DOLLARS. 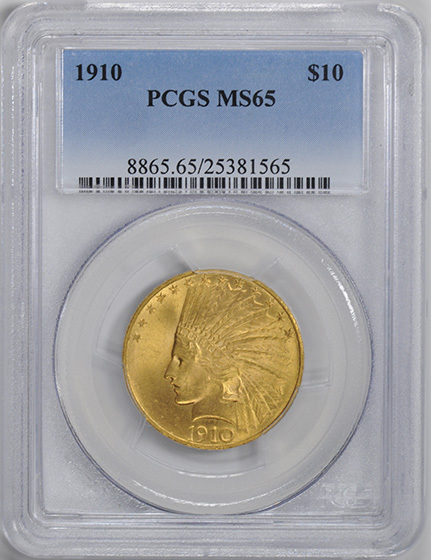 Lower relief than that demanded for Saint-Gaudens’ controversial high relief double eagle made it possible to begin minting the new $10 coins in 1907. First to be struck were the “Wire Edge” pieces, without the raised rim traditionally on U.S. coins. Five hundred were made, with 46 raised stars on their edges—symbolizing the 46 states—along with one plain-edge satin proof. These all bore triangular “periods” in legend and motto. The wire edge proved impractical, however, since the coins would not stack. Next, 31,550 pieces were struck retaining the triangular periods, but both sides were protected by a “Rolled Edge”—the sharply raised rims ordinarily used. Unfortunately, this change resulted in unsatisfactory striking quality. Rather than release these coins to possible public criticism, officials decided to melt all but 42 pieces. 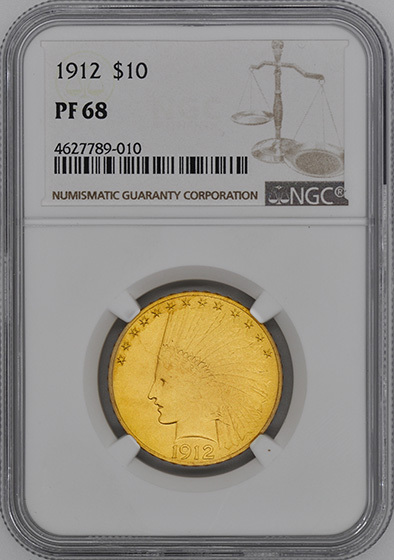 Ironically, this coin was intended for circulation, and although never officially released, it is considered a business strike—not a pattern. Under pressure to get the new eagle into circulation, Barber omitted the triangular periods and made other minor modifications. Finally, 239,406 regular-issue rolled edge pieces left the Philadelphia Mint in the fall of 1907. This design continued into early 1908. The religious motto IN GOD WE TRUST did not appear, since President Roosevelt firmly believed that use of the Deity’s name on coins smacked of blasphemy, particularly since they might be used for all sorts of immoral purposes. However, after 33,500 Philadelphia and 210,000 Denver pieces were struck, an offended Congress insisted that the lawfully mandated (Act of March 3, 1865) motto be returned to the coin, and it was placed to the left of the eagle. Coins of this final design would be struck at the Philadelphia (no mintmark), Denver (D) and San Francisco (S) mints. Mintmarks appear to the left of the bundle of arrows on which the eagle rests. 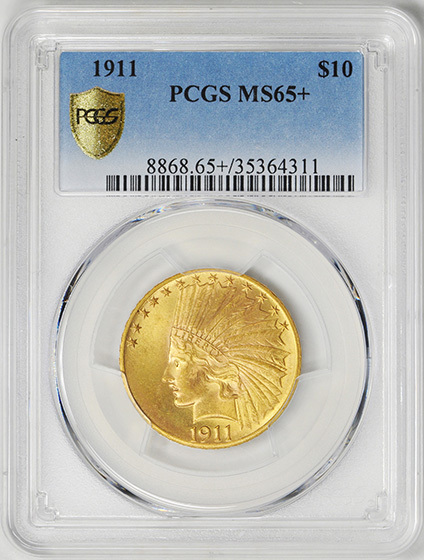 Regular issue coins were struck at all three Mints from 1908 through 1911, and 1914; Only Philadelphia and San Francisco struck eagles in 1912, 1913 and 1915, and only San Francisco struck them in 1916 and 1920. Few Americans noticed the change to 48 stars on the edge in 1912, honoring statehood achieved by Arizona and New Mexico. Coinage throughout the 1920’s was very sporadic, representing just four dates: 1926, 1930-S, 1932 and 1933. 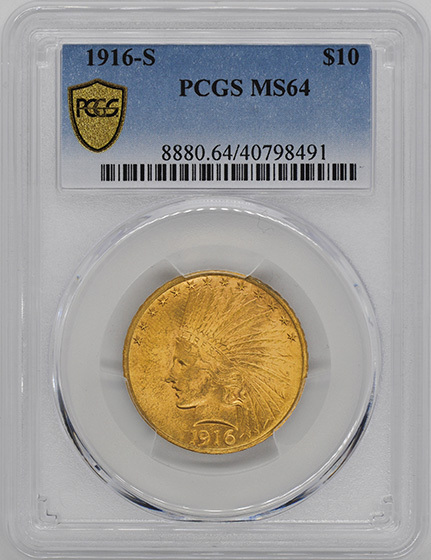 The Philadelphia Mint struck 312,500 coins in 1933, but released only a few dozen pieces before President Franklin D. Roosevelt’s Executive Order 6260 ended circulation of gold coins and notes. 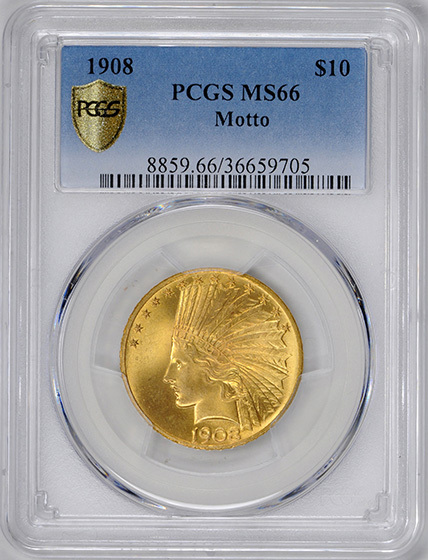 Most 1933 Indian eagles were melted into featureless ingots of .900 fine gold, disappearing with hundreds of thousands of other historic gold coins in the wake of the Presidential directive. 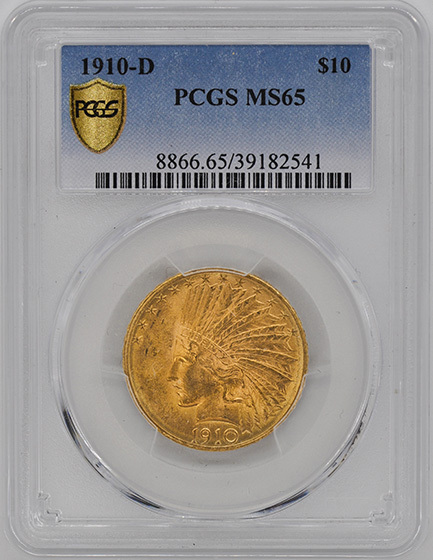 Proof issues of this series are known in two main types and various colorations. Matte or sandblast coins display subdued, microscopically grainy luster on needle-sharp strikes. Satin or Roman finish proofs were a short-lived experiment showing amazingly smooth, softly glowing surfaces. Matte proofs exist of the 1907 Rolled Edge, 1908 With Motto, 1909, and 1911 through 1915 issues. 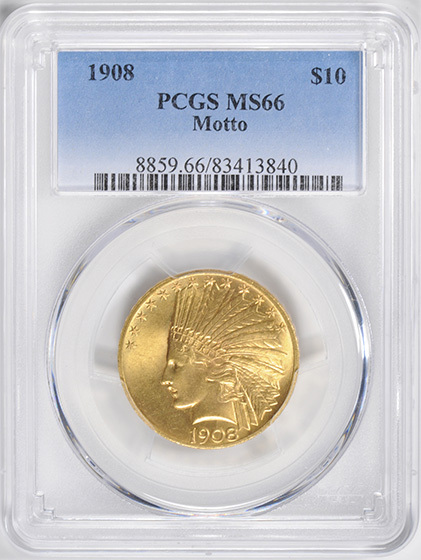 The Satin proofs include the unique Plain Edge 1907 piece, at least one each of the 1907 No Periods and 1908 With Motto coins, as well as coins of 1909 and 1910. Mint records show that a total of 13,070,583 Indian Head eagles—including proofs—were struck in all. These figures are misleading, as the 1920-S, 1930-S and 1933 coins were melted almost in their entirety. 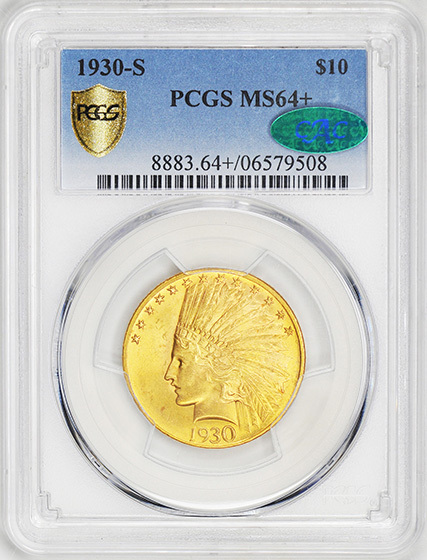 Small hoards of both the `30-S and the `33 have shown up over the years, but none of the `20-S, making this the rarest of the three. Other very elusive dates in mint state are the 1909-D, 1911-D, 1913-S and the 1915-S. In gem condition, all ten Indians are scarce, including the issues most commonly found in mint state, the 1926 and 1932. 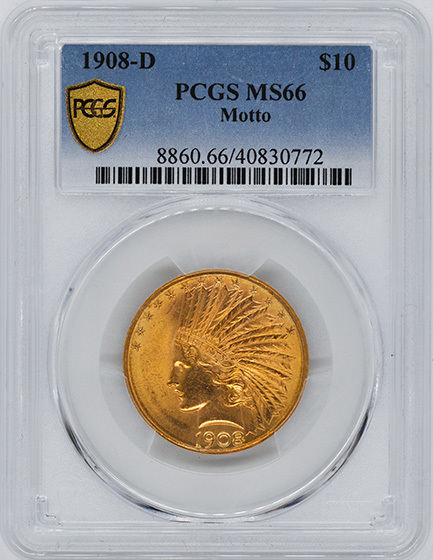 When grading this design, wear will first appear above the eye and on the cheek of the Indian, and on the reverse, on the top of the eagle’s wing. MO MOTTO. GEM SATIN LUSTEROUS SURFACES. MOTTO. VERY SCARCE IN HIGH GRADE. MOTTO. GEM SATIN LUSTROUS SURFACES. ONLY 4 GRADED HIGHER AT NGC. GEM ROMAN FINISH PROOF. ONLY 74 STRUCK. SCARCE DATE. GEM SATIN LUSTER. KEY DATE. CHOICE ORIGINAL SURFACES. KEY DATE TO THE $10 INDIAN SET. JUST 3 COINS GRADED HIGHER. GEM MATTE PROOF WITH DIAMOND CUT SURFACES. ONLY 83 STRUCK. TIED WITH ONE OTHER FOR HIGHEST GRADED. GEM ORANGE PEEL LUSTER. 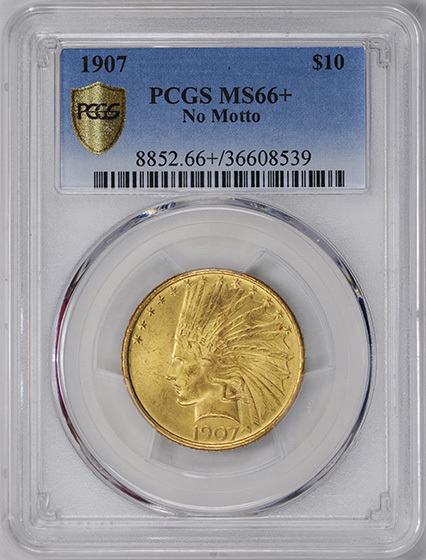 JUST 10 GRADED HIGHER AT PCGS. SATIN LUSTER. VERY SCARCE DATE. VERY CHOICE SATIN LUSTEROUS SURFACES. CAC.